From all damages of the vertebral body more often compression fractures in the thoracic and lumbar regions, rarely in the sacral spine. Compression fractures of thoracic and lumbar vertebrae (Fig. 21). occurs when falling from a height on the legs, buttocks and direct blow to the vertebra. This compression are the most mobile of the lower thoracic and upper lumbar vertebrae. Treatment compression fractures of the vertebrae is carried out by two methods: 1) long extension is functional method, the most effective (Fig. 22); 2) one-stage reposition the lumbar vertebrae with the imposition of a plaster cast that are used much less frequently (Fig. 23). 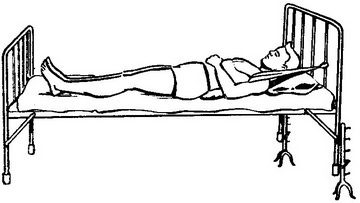 The first method of treatment patient is placed on a functional or a hard bed (with a Board), in the armpit enter soft straps (wide bandage, quilted with cotton wool), mounted at a headboard of the bed, under the lumbar region enclose a cotton pillow filling natural lordosis in the supine position. Head end of the bed is lifted from the floor level to 20-60 cm (depending on the nature of the compression and the number of damaged vertebrae). In the first period when the functional method of treatment by means of medical physical culture objectives: the removal of the patient from a state of distress, caused by trauma, recovery of muscle tone of the lower extremities (the patients have the symptom of " stuck heel", i.e. the patient is not able to lift two straight legs), and a common task: improvement of work of respiratory apparatus, blood circulation, metabolism and excretion, violated due to injury and forced body position for traction. In the first period of the exercises are performed lying on the back for all of joints of limbs and respiratory exercises. Dosage - 6-10 times each exercise. The whole complex is 4-6 times a day. Course duration is 15-20 minutes I period lasts from the moment of injury to the permission to turn around on her stomach, approximately 10-12 days. The criterion for the termination of the first period is the result in functional test: if the patient raises two straightened his legs 35-40°, he can turn on the stomach. For this, he moves to the edge of the bed, one leg, lying close to the edge, puts strastno over the other leg; removes straps; a hand that is closer to the center of the bed, straightened along the body, the patient is kept by the straps and quickly turned on his stomach in the center of the bed. II period lasts from the moment of turning on the stomach before permission to get up and walk. The task of therapeutic gymnastics is the maximum development and strengthening of the back muscles, i.e. the formation of natural muscular and correct posture. Duration of studying is 40-45 minutes They are 5-G once a day. Breathing exercises are repeated 3 times, General developmental-6-10 times, exercises in a static voltage is 4-10 times with the mandatory rest after 2-4 exercises. To monitor the development of power trunk muscles A. N. Tranquilitate suggested the following functional tests, which allow to solve the question of the necessity of artificial corset. 1. Lying on his stomach, arms bent at the elbow joints, chest, at the same time to raise his head, bent at the elbow, the front part of the body and straightened his legs. The instructor puts one hand on the area of blades, the second - on the rump and with the effort of trying to straighten the back of the patient at his resistance. If the muscles of the back are developed well, the instructor is not able to do it. 2. Lying on his stomach, hands up: to lift both hands, his head, the front part of the body and straightened his legs (pose "swallow"). Instructor puts one hand on the area of blades, the second - on the rump of the patient and presses with effort of one or the other hand. If the muscles of the back of the patient strong, the trunk will touch beds the upper part of the chest, hips, as a paperweight; if the muscles are weak, will fall at once and chest and hips.